This guide will help you understand what JPA is and setup a simple JPA example using Spring Boot. What is the problem solved by JPA - Object Relational Impedence? What are the alternatives to JPA? What is Hibernate and How does it relate to JPA? How to create a simple JPA project using Spring Boot Data JPA Starter? What is Object Relational Impedence Mismatch? Java is an object oriented programming language. In Java, all data is stored in objects. Typically, Relational databases are used to store data (These days, a number of other NoSQL data stores are also becoming popular - We will stay away from them, for now). Relational databases store data in tables. The way we design objects is different from the way the relational databases are designed. This results in an impedence mismatch. Lets consider a simple example - Employees and Tasks. Each Employee can have multiple Tasks. Each Task can be shared by multiple Employees. There is a Many to Many relationship between them. Let’s consider a few examples of impedence mismatch. Example 1 : Task table below is mapped to Task Table. However, there are mismatches in column names. Example 2 : Relationships between objects are expressed in a different way compared with relationship between tables. Each Employee can have multiple Tasks. Each Task can be shared by multiple Employees. There is a Many to Many relationship between them. Other approaches before JPA focused on queries and how to translate results from queries to objects. Setting parameters to the query. We need to read values from objects and set them as parameters to the query. Liquidation of results from the query. The results from the query need to be mapped to the beans. In the example below, the query used is Update todo set user=?, desc=?, target_date=?, is_done=? where id=? Results from the query are populated into the ResultSet. We had to write code to liquidate the ResultSet into objects. MyBatis removes the need for manually writing code to set parameters and retrieve results. It provides simple XML or Annotation based configuration to map Java POJOs to database. JDBC or Spring JDBC - Update todo set user=?, desc=?, target_date=?, is_done=? where id=? JDBC, Spring JDBC and myBatis involve writing queries. In big application, queries can become complex. Especially when we retrieve data from multiple tables. This creates a problem whenever there are changes in the structure of the database. 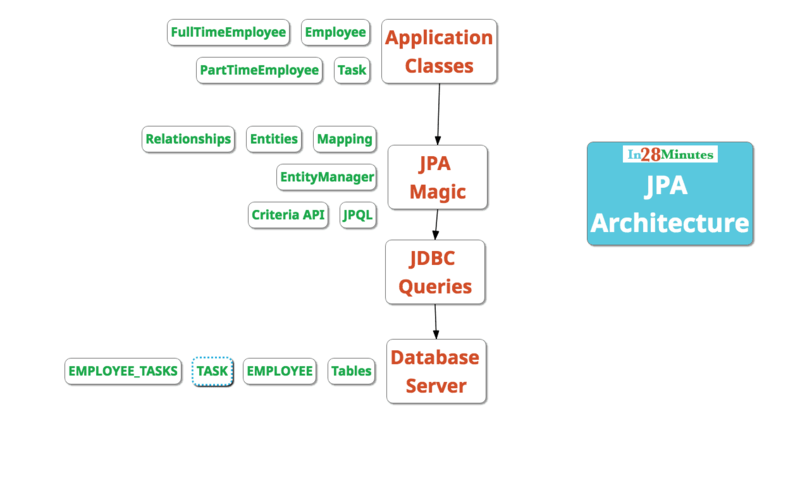 JPA evolved as a result of a different thought process. How about mapping the objects directly to tables? This Mapping is also called ORM - Object Relational Mapping. Before JPA, ORM was the term more commonly used to refer to these frameworks. Thats one of the reasons, Hibernate is called a ORM framework. Hibernate is one of the most popular ORM frameworks. JPA defines the specification. It is an API. How do you define entities? How do you map attributes? How do you map relationships between entities? Hibernate is one of the popular implementations of JPA. Hibernate understands the mappings that we add between objects and tables. It ensures that data is stored/retrieved from the database based on the mappings. Hibernate also provides additional features on top of JPA. But depending on them would mean a lock in to Hibernate. You cannot move to other JPA implementations like Toplink. Lets look at a few examples to understand how JPA can be used to map objects to tables. Relationships between objects are expressed in a different way compared to relationship between tables. Each Employee can have multiple Tasks. Each Task can be shared by multiple Employees. There is a Many to Many relationship between them. We use @ManyToMany annotation to establish the relationship. Some times multiple classes are mapped to a single table and vice-versa. In these situations, we define a inheritance strategy. In this example, we use a strategy of InheritanceType.SINGLE_TABLE. Creating a JPA application with Spring Initializr is very simple. H2InMemoryDbDemoApplication.java - Spring Boot Launcher. Initializes Spring Boot Auto Configuration and Spring Application Context. application.properties - Application Configuration file. H2InMemoryDbDemoApplicationTests.java - Simple launcher for use in unit tests. pom.xml - Included dependencies for Spring Boot Starter Web and Data JPA. Uses Spring Boot Starter Parent as parent pom. Lets define a bean User and add the appropriate JPA annotations. private String name;// Not perfect!! Should be a proper object! private String role;// Not perfect!! An enum should be a better choice! @NamedQuery: Specifies a static, named query in the Java Persistence query language. Typically with JPA we need to create a service to talk to the entity manager. In this example, we create a UserService to manage the persistence of user entity. @Repository: Spring Annotation to indicate that this component handles storing data to a data store. @PersistenceContext: A persistence context handles a set of entities which hold data to be persisted in some persistence store (e.g. a database). In particular, the context is aware of the different states an entity can have (e.g. managed, detached) in relation to both the context and the underlying persistence store. EntityManager : Interface used to interact with the persistence context. entityManager.persist(user): Make user entity instance managed and persistent i.e. saved to database. entityManager.createNamedQuery: Creates an instance of TypedQuery for executing a Java Persistence query language named query. The second parameter indicates the type of result. CommandLineRunner interface is used to indicate that this bean has to be run as soon as the Spring application context is initialized. We are executing a few simple methods on the UserService. @Autowired private UserService userService: Autowire the user service. Rest of the stuff is straight forward. Spring Data aims to provide a consistent model for accessing data from different kinds of data stores. UserService (which we created earlier) contains a lot of redundant code which can be easily generalized. Spring Data aims to simplify the code below. 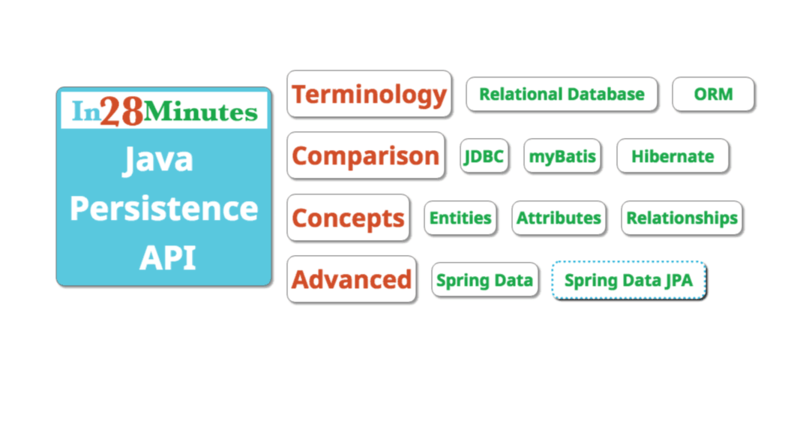 Spring Data Commons - Defines the common concepts for all Spring Data Modules. Spring Data JPA - Provides easy integration with JPA repositories. CrudRepository is the pre-defined core repository class (in Spring Data Commons) enabling the basic CRUD functions on a repository. Important methods are shown below. JpaRepository (Defined in Spring Data JPA) is the JPA specific Repository interface. We will now use the JpaRepository to manage the User entity. Below snippet shows the important details. We would want the UserRepository to manage the User entity which has a primary key of type Long. The code below is very simple. CommandLineRunner interface is used to indicate that this bean has to be run as soon as the Spring application context is initialized. We are executing a few simple methods on the UserRepository. @Autowired private UserRepository userRepository: Auto wiring the user repository. You can start the application by running H2InMemoryDbDemoApplication as a java application. Where is the database created? What schema is used to create the tables? Where are the tables created? Can I see the data in the database? Where is Hibernate coming in from? How is a datasource created?